I am still (still) in need of a new camera, and snapping away on my practically prehistoric iPhone 5 just isn't cutting it for me in the photography stakes. But I wanted to keep on documenting my little life so have decided to make the most of what I have by publishing a series of "mini reviews" (in my mind, making it a mini review takes the pressure off my photography game somewhat). What's the idea? 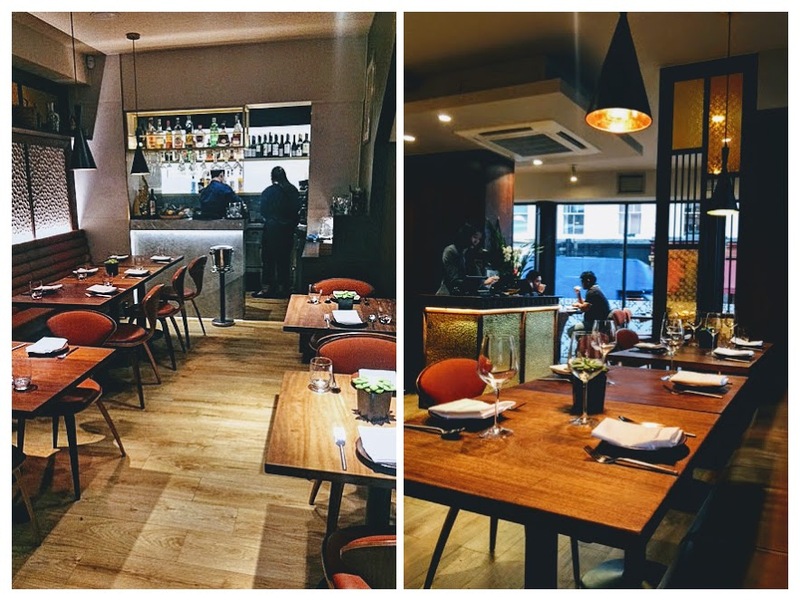 : Their website states that they provide "contemporary Thai cuisine, elegantly presented in a relaxed and stylish environment." They also boast an OpenTable 2018 Diners' Choice award. First impressions: Blooming 'eck this place smells good! I can't work out if I want to eat that fragrance or trap it in a glass, stick a wick in it and take it home for relaxing bubble baths. What we ate: Even for veggies, choosing is difficult. The menu is full of lemongrass, chilli and herbs (which probably explains the aroma pervading the restaurant) and each dish sounds exquisite. Our table plumps for a juicy bottle of Domaine de Pourthie merlot (recommended by Michele's cousins who have visited before) and a round of Singha beers whilst we decide. In the end, we order a few plates of spring rolls (fairly average - not bad, just average), prawn rice rolls (light, fragrant, mild - I'm really not keen on the chilli and lime dressing they come with though, so I steal a bit of the sweet chilli sauce that comes with the other dishes) and, the winner in my book, the vegetarian fresh rice rolls (wonderfully herby and deliciously healthy). For mains, there's a lot of interesting-looking meat being consumed down the non-veggie end of the table (segregation happened quite by accident, honestly!) but we go for the pad thai and the lemongrass tofu, the latter being the closest thing I can find to the scent on the air. At the end, we order the baked banana served with banana and peanut ice cream. What we thought: The pad thai was, like the spring rolls, fairly average. Not bad, just average, but perhaps a little disappointing given the promise of fragrant delights offered by the menu (and, yep, that wonderful smell). The lemongrass tofu was quite a surprise - I had in mind slices of fresh tofu in a golden glaze of flavour but upon arrival, I am presented with what is ostensibly a platter of chicken nuggets and gravy. It turns out that the tofu is battered and the gravy is the lemongrass sauce. On its own, the tofu is pretty bland but that's fine because once it's been suitably doused in the lemongrass, it's really quite delicious. My cravings brought on by the restaurant's perfume are suitably satisfied. Dessert is also pretty good; the banana itself is a little dry from the baking but it's absolutely smothered in ice cream and what tastes like a coconut-scented, light-as-air cream. Even Michele, the infamous banana hater, likes it. The important stuff - what were the loos like? : There's only one cubicle per gender but then it is a small restaurant and at least they're clean and nicely decorated. On the day we visited though, they were absolutely freezing! Do they take bookings? : Yep! You can book online (no speaking to an actual person, yesss). So that's the end of my first mini review! I'm planning on following the same format in this little series, so if there are any other important questions I should cover, let me know in the comments!